At Intrinsic Imaging, our team consists of more 500 full time and consulting board-certified, fellowship-trained physicians and key opinion leaders (KOLs) with sub-specialization in all therapeutic areas. Our expertise includes, but is not limited to, Cardiovascular, Gastrointestinal & Genitourinary, Medical Device, Musculoskeletal, Neurology, Oncology and Ophthalmology. For each trial, we assign a Medical Director specialized in that therapeutic area and we assign a team of reviewers who are fellowship trained and experienced in the therapeutic indication. Throughout clinical trials, screening images are able to be read and reported within 24 hours of query resolution. Patient timepoints from subsequent visits are typically scheduled to be read within a few business days. However, upon request, these images are also read and reported within 48 hours. At Intrinsic Imaging, all of our 80 board-certified, fellowship trained radiologists are full time. For each clinical trial, we manage all radiologists and ensure they are all qualified, trained and able to review patient timepoints correctly and in a timely manner. We recognize it is essential to ensure radiologists review each patient timepoint accordingly. We therefore implement our ISO certified processes to ensure that every patient timepoint is reviewed exactly per the imaging charter. At Intrinsic Imaging, we plan, implement and monitor radiology reviews meticulously to ensure success. Whether the radiology review is in support of a Phase I-IV clinical trial or in support of a Class I, II or III trial to study a medical device, Intrinsic Imaging radiologists have the expertise and experience. We process all patient timepoints immediately upon receipt. 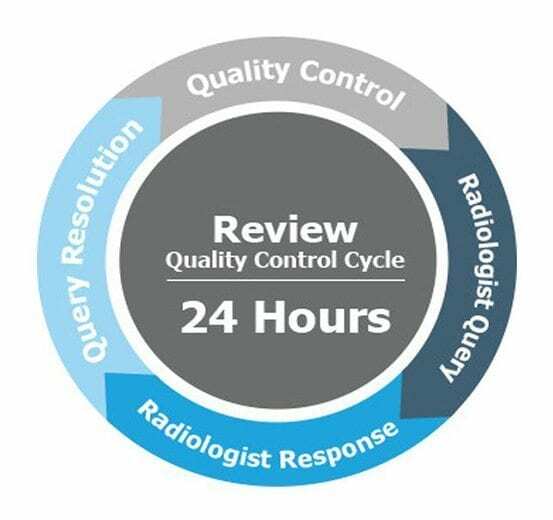 Once a radiology review is complete for a patient timepoint, we quality control each and every case report form within 24 hours of radiologist review to ensure the reader has completed the form as per the Imaging Charter.